We have been supplying the Rittal Hygienic Design range for many years. Customers have benefitted from better protection of their electrical and electronic equipment, as well as less time spent washing down, and cleaner manufacturing environments. Fire extinguishers are an absolute necessity on any manufacturing site, but they can be a haven for dirt and bacteria in food safe areas. 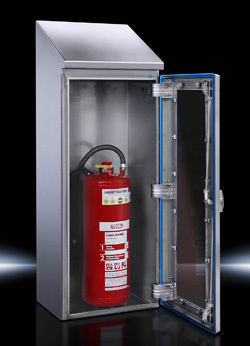 A new addition to the Rittal HD range, the Hygienic Design fire extinguisher enclosure is a simple solution that not only reduces the risk of contamination from these essential devices, it also protects them, helping you to ensure that they are fully functional whenever they‘re needed. Its sloped roof, blue silicone seal, internal hinges and locking mechanism, welded stainless steel construction, viewing window and T-handle all result in fewer dirt traps and quick and easy cleaning. These also provide ingress protection to IP69K, and allow for inventory checks at a glance as well as, crucially, easy single-handed access. If you have any questions about Rittal Hygienic Design enclosures, or would like help to specify the right enclosure for your specific requirements, give us a call on 01254 685900 and one of our sales or technical support engineers will be happy to help.